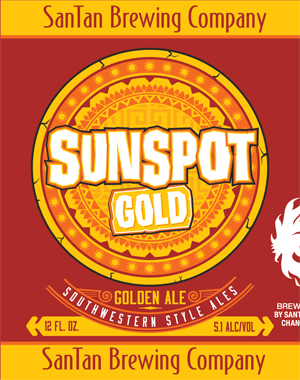 SunSpot Golden Ale was the first beer brewed at SanTan and is a recent addition to the brewery’s lineup of canned beers. It is brewed with two-row barley, wheat, Vienna and Munich malts and hopped with Columbus and CTZ hops. If the brewers were trying to mimic the color of a hazy, early morning Arizona sunbeam, they did a great job. The head atop this golden beauty is snow-white and lingers long before dissipating. Sunspot sports a light body that’s crisp and lively along with aromas of lightly toasted cereal. The first sip is mostly that of cereal, but there is a slight fruitiness to it as well, before just a hint of grassiness and spice comes in to tickle the palate. The beer finishes clean with just enough there to tease you into another sip.